Gov. Tim Pawlenty and leaders of three northern Minnesota Indian tribes say they were pleased with an historic meeting on the White Earth Reservation Thursday. Much of the discussion centered on the governor's push to change the landscape of casino gambling in the state. White Earth, Minn. — A drum group welcomed Gov. Pawlenty with an honor song. The governor shared fry bread and wild rice with the tribal leaders, and participated in a pipe ceremony. The gathering included leaders of the White Earth, Red Lake and Leech Lake reservations. The three Ojibwe bands want to open a casino close to the Twin Cities. "This is truly an historic day for the White Earth Band of Ojibwe," said White Earth Tribal Chair Erma Vizenor. She says Pawlenty is the first governor ever to visit her reservation. Vizenor says the visit was productive. "We've had an intense day, but extremely, extremely rewarding and fruitful in the dialogue and the relationships that we have established and reinforced," Vizenor said. The governor has been trying to get the state's wealthier tribes to share their casino profits with the state. The three northern tribes say because of their rural location, they have nothing to share. But White Earth, Red Lake and Leech Lake leaders are promoting legislation called the Minnesota Gaming Equity Act, which would allow them to open a casino in the more lucrative Twin Cities area. The proposed $476 million facility would be the largest casino resort in the state. It would include up to 5,000 slot machines and a 500-room hotel. The casino would be run jointly by the tribes and the state of Minnesota. No decisions have been made, no commitments have been given. But the commitment is to further review those ideas. The state would get an estimated $90 million in revenue each year, while the the three tribes would split about $130 million annually. Pawlenty didn't commit his support for the plan. He says for now, he's leaving the state's options open. "We are feeling very positive about the discussion that took place today. Where it's at at the moment is that there was simply an exchange of ideas, a little bit of discussion about the tribal Gaming Equity Act, some new ideas that we've asked the tribal leaders to at least consider," said Pawlenty. "No decisions have been made, no commitments have been given. But the commitment is to further review those ideas." 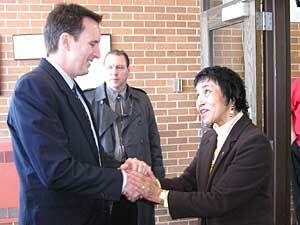 Pawlenty and tribal leaders met behind closed doors. None of the participants would share specifics about what sort of proposals the governor suggested. Pawlenty made clear the two sides aren't interested in renegotiating current gambling compacts. He also said any potential partnership would leave management of a gaming facility to the tribes. The tribes that run casinos closer to the Twin Cities have seen enormous success. Some of those tribal members receive large monthly checks from casino profits. Those wealthier tribes have had a frosty relationship with Pawlenty, especially since he suggested they share 25 percent of their profits with the state. Pawlenty says dialogue with them has been limited. "We continue to signal to them that we would love to visit with them further, and have a discussion with them," said Pawlenty. "I don't want to speak for them, but I think it's fair to say they're not interested." Some northern tribal leaders say this may be the year their Gaming Equity Act gets approved by the Legislature. This will be the fourth year the Twin Cities casino plan has been presented to lawmakers. Sen. Rod Skoe, DFL-Clearbrook, represents a district that includes both White Earth and Red Lake reservations. Skoe has opposed their plan in the past. He says he and some other lawmakers have changed their minds. "I have come a long ways in my understanding of gaming in Minnesota, and I have developed an understanding that gaming is expanding in Minnesota," Skoe said. "And if there is some way to do it so it's more fairly beneficial to all the people that it was intended to benefit -- when you think back to the compacts, they were supposed to benefit all of the Indian peoples of the state. And it's not evenly distributed. And we need to look at that." The northern tribes' proposed Twin Cities area casino would be paid for by the sale of high-yield bonds to private investors. Leaders say they haven't selected a specific site yet, but they're considering possible locations in Burnsville, Albertville or somewhere in Anoka County.